into the woods. — halthegal. 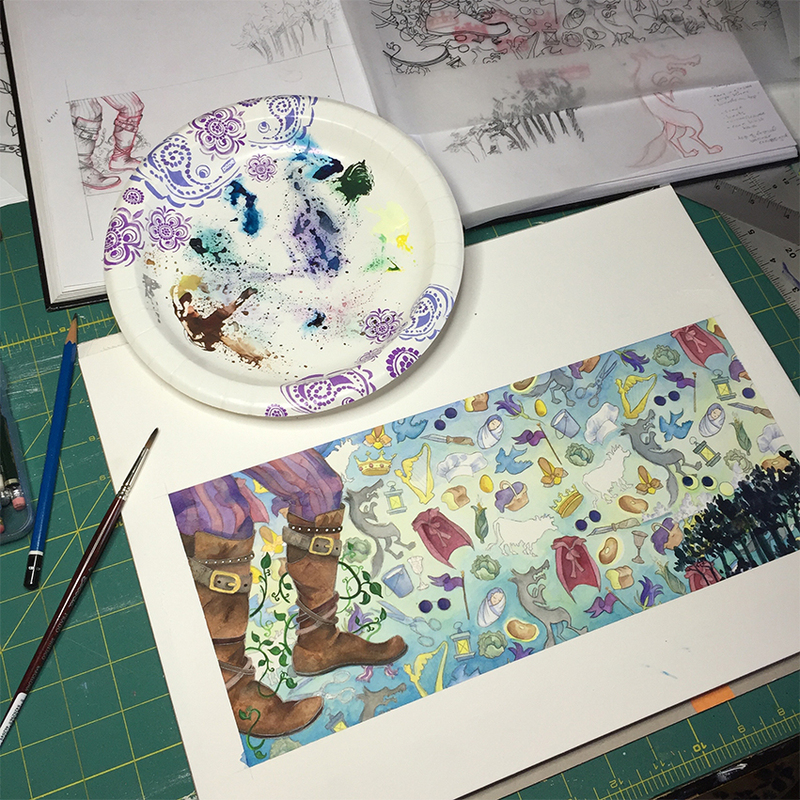 faerie tale feet piece inspired by sondheim & lapine's musical into the woods. i have to confess, the first time i learned of this musical was a quip from the gilmore girls. brad returns from a stint on broadway as jack and paris, of course, torments him with his solo from the play. so i dashed to barnes & noble, bought the two-disc original broadway cast recording, and my dreams of seeing it were realized when disney produced its lavish film just last Christmas. like most sondheim works, the characters sing over each other occasionally. but it’s still a lovely sound. and reading the original book that was published from the 1988 broadway script put all the characters into perspective. after i did all my research (reading the original script, watching the filmed original broadway production, watching the disney version over and over with commentary, etc. ), i created by background pattern. once all the icons were decided upon and the giant’s boots were drawn, i traced them onto tracing paper- and taped it on top of my watercolour paper. 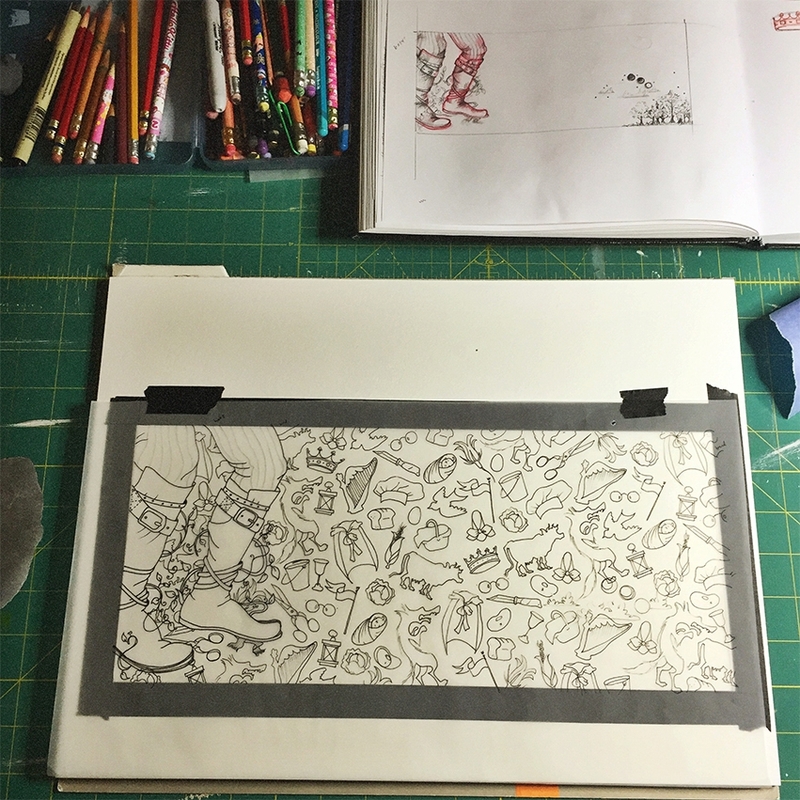 using my handy magnifying lamp, i put transfer paper between my patterned tracing paper and my watercolour paper so i can retrace all the icons so i know where to paint. oh la la! first layer of colour is down! 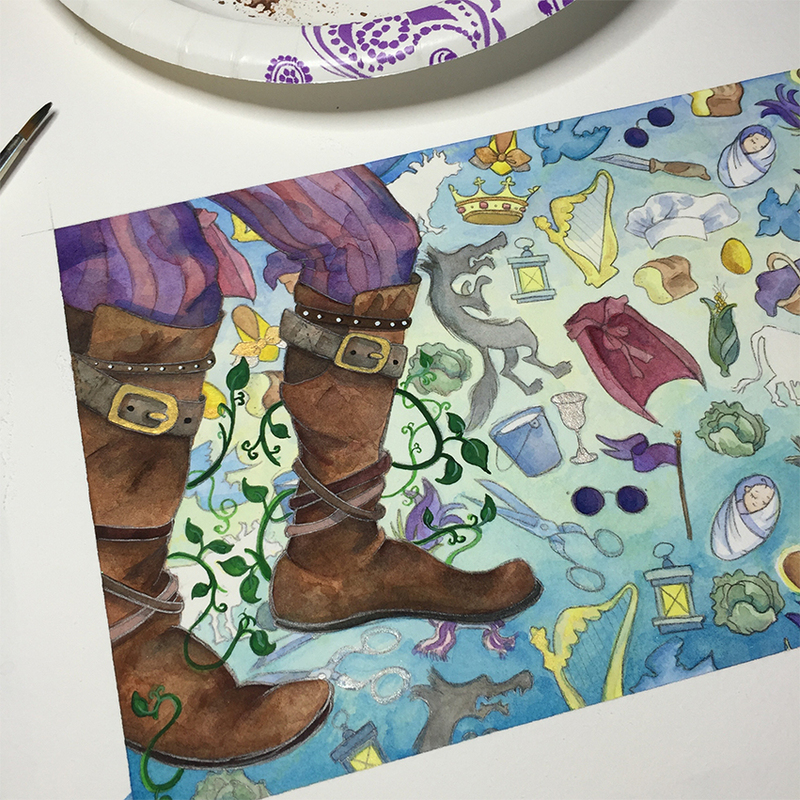 now we keep adding details and shading and adjusting washes and colours- and those boots have a ways to go before they’re done! every time i exercise in my local park, i feel like leslie knope would be proud of me. i would like to think i earned another pawnee goddess badge for using my local park trees for reference. painting landscapes aren’t my strongest suit. but i had to add some WOODS for a piece inspired by “into the WOODS.” so i did my best, painting trees on top of my finished background painting. here’s a better detail of the giant’s boots & pants. i’m quite pleased. and i know the giant’s wife didn’t step ON the baker’s wife, but i did put her scarf below his left foot. because: symbolism. drama. cabbage/rampion- there’s a long linguistic history, but “rapunzel,” the baker’s sister he didn’t know he had & his neighbor the witch’s captive/adopted daughter- “rapunzel” is a type of cabbage which is why one of the princes comments what a ridiculous name his brother’s beloved obsession has. cinderella (the golden slipper) wishes to go to the king’s festival, so there’s a royal purple banner with the king’s crown atop it. there’s red’s basket she carries to granny’s house. there’s the five magic beans the baker & his wife pay jack for his cow, milky white. there’s the baker’s loaf of bread. there’s golden eggs from the hen and the golden harp that jack brought down from the giant’s house in the sky. there’s a lantern for traveling through the woods at all hours. the silver goblet the witch drinks the potion out of to lift the curse/spell once all the items are fed to the cow. campanula paunculus- rampion- a purple bellflower in the witch’s garden, another derivative for “rapunzel”when you go back to the latin. and the wolf sings to red about missing all the flowers by staying on the path to grandmother’s house. tempting. i think that’s it… oh! three moons over the woods because the baker & his wife only had three midnights to collect all the objects the witch required to break the spell– the curse on their family tree and the curse of old age & ugliness her mother placed on her for losing the magic beans that the baker’s father stole out of her garden. it’s a magically inter-woven plot and musical. i’m a sucker for a good fairy tale mash up. and set to music? all the better. even if act II isn’t quite as happy as act I. plot twist! original framed painting available for $525 (+$40 for safe US shipping). message me. collect the limited edition signed, titled, and numbered archival prints HERE in my etsy shoppe!